While Stonewall Bowling Pittsburgh is a recreational league, league rules are in place to ensure all members understand how the league is run and what you can expect by participating in the league. The league will bowl at AMF Noble Manor Lanes at 7:30pm with practice starting at 7:20pm. Each season consists of 1 welcome week, 8 weeks of scheduled league play and a championship week. League fees must be paid at the time of online registration, as directed. All bowlers must observe the rules and regulations of AMF Noble Manor Lanes, which includes not bringing outside food and beverage, not smoking in designated areas and responsible use of their facility. Team rosters must consist of at least 3 players and up to 6 players. Teams must designate a captain to be the primary point of contact for league communications. Captains are also responsible for identifying the scored bowlers per game on the provided score sheets prior to weekly play. Teams captains will NOT be required to have a roster of more than 3, though it is highly recommended to be flexible to accommodate schedules and availability. See additional absence and scoring rules below. Captains will opportunity to pick-up free agents using the online registration system. Network with interested bowlers in our Facebook Discussion Group. The league schedule will be randomly generated and provided prior to the start of league play. Highest average from the most recent winter season in any USBC league, based on 21 games or more. Highest average from the most recent winter season from non-USBC league with verifiable standing sheet, based on 21 games or more. Bowlers who do not have a qualifying average outlined above will establish their average the first session they bowl. Bowlers must establish an entering average before scores will be counted in team play. The league will determine wins and losses on a handicap basis. Handicap will be 90% of the difference between a bowler’s SCORED GAME average and a scratch figure of 225. No negative handicaps apply for averages over 225. Team position standings shall be determined on a 7 point basis, with 2 point(s) awarded for each game won and 1 point awarded for the high team series in each match. League standings will be determined based on total number of wins. For the purpose of playoff seeding, ties in the league standings will be broken by Total Scored Pins. Prior to the start of each week, the team captain, or delegate, must identify the players present and the 3 players per game that will be scored in league play. If a team has more than 3 players present, each player must be scored at least once. It is as the discretion of the individual player, if they would like to bowl when their score is not factored into the team score. 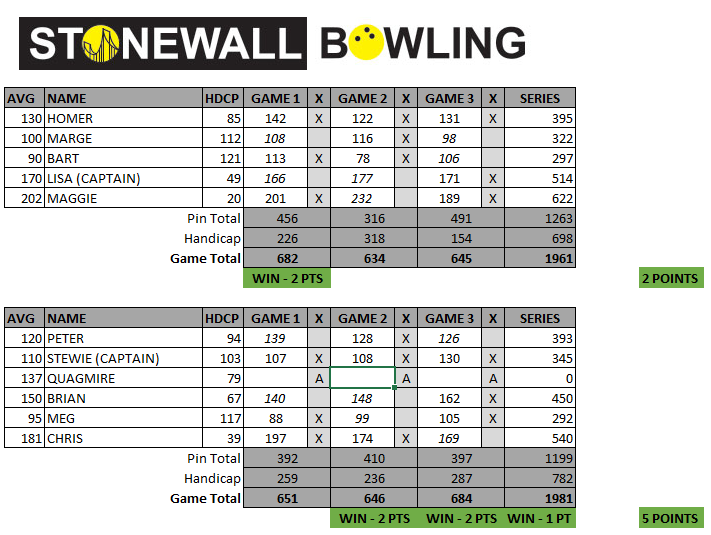 Each game, the total pins plus handicap for each scored bowler will be added together for a total game score. A win is worth 2 points and a tie is worth 1 each. No tie-breakers exist in regular season play. A bowler who arrives late may enter the game provided 3 frames have not been completed. In this situation frames missed may be made up. When bowling in a known forfeit situation or scheduled against a non-existent team, the team must bowl at least the team average less 10 pins per player to earn the points. The minimum legal lineup of 2 players must be available before the completion of the third frame of each game, or forfeit the points for that game. In the event that only 2 bowlers are present, the team may select one rostered player to receive 80% of their average. Special Absence: In the event a team is unable to provide a legal lineup to do an injury, the team captain may request to use a substitute bowler from another team whose scored average is +/- 10 pins from the injured bowler. This request requires approval from both captains and a member of league leadership. During the playoffs, a tournament will occur with seeding based on league standings. In the interest of time, the league may limit the number of bowlers per lane to 3 per game. Extra bowlers may bowl on extra lanes freely, based on availability. As teams advance between rounds, teams must make reasonable efforts to include all present rostered members in their scored play. In the event of a tie game during playoffs, games will continue as “extra 10th frame” until the tie is broken.